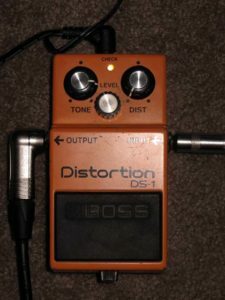 In part 1 I installed a selection of capacitors to sort out the noise issues commonly associated with the stock Boss DS-1 Distortion pedal. The next stage of my modifications was the Marshall JCM style tonal changes. cubisteffects gave me a selection of LEDs, capacitors and a a resistor to change my old buzzy distortion box to a smooth and creamy tone machine. I installed these parts last night, and everything went along smoothly. Everything was a piece of cake to install after going through the first round of modifications. This morning once everyone was up I was able to turn my HT-5 up to reasonable level to take a listen to my handiwork. I also thought I would have a look at the install job again to make sure everything looked ok. It was at this point I realised that I had accidentally installed the LEDs around the wrong way, mixing up the polarity. I went to de-solder the two LEDs so I could put them in the right way round, and once I removed the LEDS completely from the PCB I suddenly realised something was amiss. I had accidentally taken off the tracks around the solder points. I couldn’t actually get any solder to stick to them after I had aligned the LEDS the right way round. After freaking out a bit I decided I would try some conductive wire glue that I had lying around. Thankfully that seems to have taken OK, and now everything is back together and working fine. Stage 2 of the cubisteffects mods complete! I also replaced the red LED indicator light with a new one that glows orange, showing that this little DS-1 is no ordinary stomp box. So on to the important part, how does it now sound? I have found that the second stage of modifications have indeed turned the old buzzy noise box in to a smooth creamy distortion machine. There is not as much gain now, but it is a far more pleasing tone that is generated. It is much more rounded and smooth. The tone has changed dramatically too. I would have normally set the tone knob between 11 and 12 o’clock prior to the modifications. I am now rolling the knob to 3 or 4 o’clock. The pedal now sounds like a nice smooth, full rock machine through the clean channel of my HT-5. Using the DS-1 as an overdrive on the dirty channel of my HT-5 resulted in a far stronger tone. It isn’t getting all flabby and buzzy. The modifications have made the DS-1 enhance my HT-5s dirty channel rather than alter it. Here are some samples of the same riffs recorded after the first stage of modifications. Again my recording method is a little rough. I’m using the direct out on my HT-5 in to the line in on my PCs sound card. Not the nicest recording pathway, but it gets the point across. Once again a big thanks goes out to cubisteffects for kindly giving me the parts and help to make these modifications. 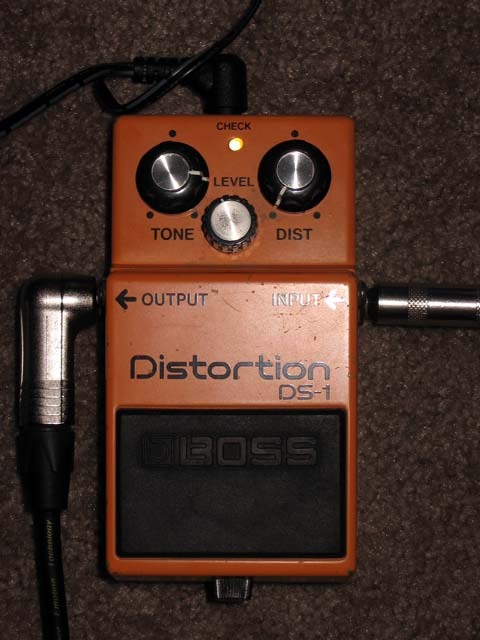 4 Responses to "Modding the Boss DS-1 – part 2"
That’s sounds great! 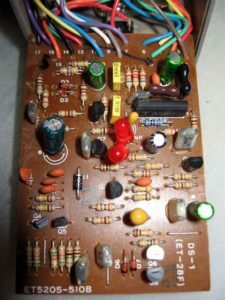 I’d very much to try it myself, where can I get a hold of schematics and parts? Hi there. Thanks, it did sound great. I tried making some more mods and busted the pedal a bit. I am working on troubleshooting it when I have time. If you would like to know what components are replaced, and the new parts, etc I can send you an email with this information. 🙂 You should be able to buy parts from your local electronics store. If you want to just use it for DIY that’s cool. If you would like to write about it on a blog or site could you please remember to cite cubisteffects (www.cubisteffects.com) as the provider of this mod? Can I email you on the address you provided with your comment? Sorry for no reply earlier. What mods did you make to your DS-1?